By D Magazine | 3 years ago Check off your holiday list with an assembly of style-packed gifts curated by our editors. By Jessica Jones | 3 years ago From her layered aesthetic to her collaborative work approach, Samantha Reitmayer Sano believes there’s beauty in abundance. By Stacy Girard | 3 years ago For homeowners Donna and Larry Olschwanger, it took some tough decision-making and a style-altering renovation to turn a ’30s-era cottage. By D Magazine | 3 years ago A hands-on guide to the season courtesy of some of the city’s most formidable experts. By D Magazine | 3 years ago Spires and coils on these tables and cabinets will help you get stacked. By D Magazine | 3 years ago Why let your wardrobe have all the fun? Layer on the lavish. By D Magazine | 3 years ago You can’t lose with these hues and ombré prints. By Caitlin Clark | 3 years ago All the latest home retail news and more. By D Magazine | 3 years ago We sent our roving reporter in search of a perfectly coiffed head of hair. By Ryan Conner | 3 years ago Kristi Schroeder has given a classic textile art a modern revamp, proving it’s hip to be square. By D Magazine | 3 years ago Go natural, fir real! By D Magazine | 3 years ago A quick look at just how far your money will take you in local real estate. By Kimberly Schlegel Whitman | 3 years ago Cater to your guests for an unforgettable affair. By Billy Milner | 3 years ago An ornamental guide. By Lisa Garza | 3 years ago These tips will help make your soiree a success. By Nancy Nichols | 3 years ago Why lift a finger to serve your guests delicious fare? By Britni Wood | 3 years ago How the pros present their presents. By D Magazine | 3 years ago Pogo's Wine & Spirits' Harris Polakoff helps us pick the perfect vintage and varietal for your guests. By D Magazine | 3 years ago Lend a helping hand this season. 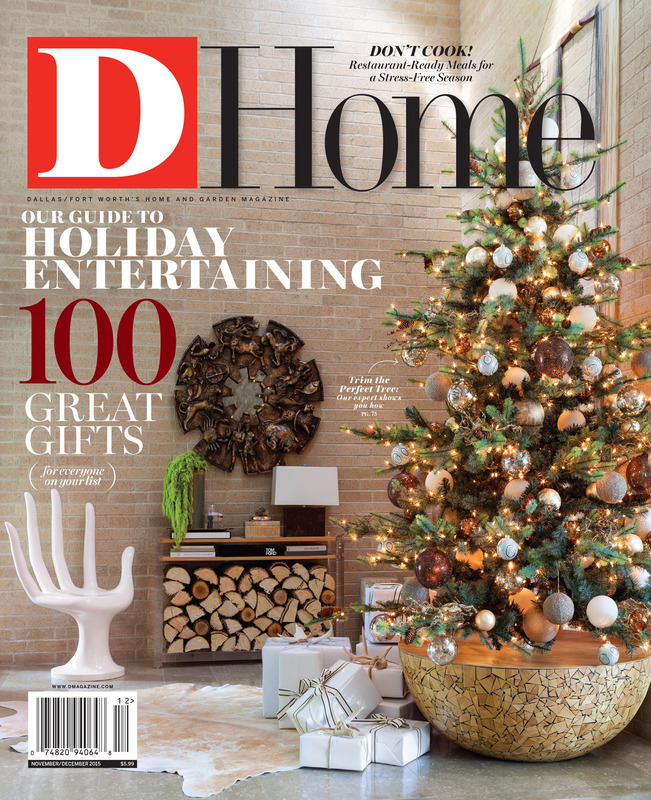 By D Magazine | 3 years ago Your holiday guests will want all the scoop.